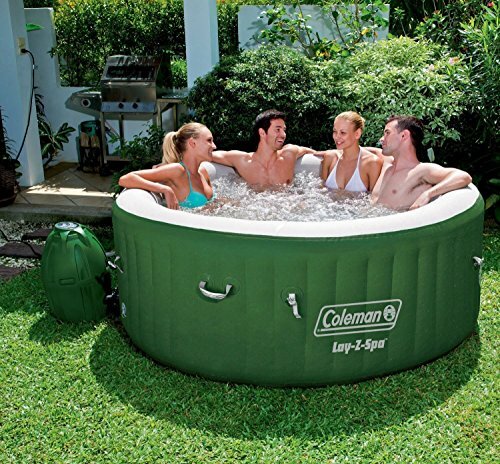 The Coleman Lay-Z Spa inflatable hot tub is the affordable, go-anywhere spa which can comfortably accommodate up to 6 adults. This fully portable, inflatable hot tub can be easily set up either indoors or outdoors within minutes. The Lay-Z-Spa requires no tools or professional installation. – Water Capacity: 254 gal. – Filled weight: 2,701 lbs. With its soothing 104 Degree F water temperature and massage jets, the Coleman Lay-Z Spa is perfect for soaking sore muscles, unwinding after a hard day at work or even as a luxurious and romantic treat for you and your partner to enjoy together. The digital control panel allows you to turn up the heat without having to exit the tub. The Coleman Lazy-Z Spa also comes supplied with a cover to maintain optimal water temperature, a set up and maintenance guide DVD, filter cartridges (twin pack) and a chemical floater.